Swarovski is about to release another Swarovski Disney Myriad…Donald Duck! Myriad Donald Duck is a 2015 Swarovski Limited Edition that stands about 9.5 inches high. Donald Duck is limited to 150 units worldwide, probably because each one takes about 110 man-hours to make! Swarovski Myriad Donald Duck is decorated using their exclusive Pointiage® technique. Retail price at launch time is $8900. 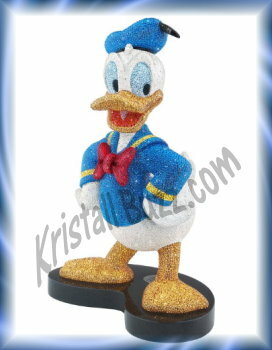 The Limited Edition Donald Duck has been assigned the Swarovski system number 5 063 919. The Swarovski Disney Myriad…Donald Duck should be available at the Swarovski web site near the end of 1st quarter, 2015. This is expensive news for Crystal Fanatics and Disney Fanatics alike! Get ready to spend some big dollars if you want to purchase the newest Swarovski Limited Edition. Swarovski has released another Swarovski Crystal Myriad, Ji Xiang! Swarovski Ji Xiang is just over 14.5 inches high and about 9.25 inches wide. The subject of this Swarovski masterpiece is two red carps, atop blue foaming waves. Crystal Myriad Ji Xiang is embellished using more than 48,600 hand-set crystals, which are utilized in the pointiage technique. The carps symbolize prosperity and good luck in China. This Crystal Myriad will retail for $18,000 USD at product launch. The Myriad of Carps was designed by Heinz Tabertshofer. Hopefully he does not have to remain on the assembly line during production, which takes over 390 man-hours to assemble! The pair of red carps, Swarovski Ji Xiang, is a Limited Edition, with only 300 units planned for production. Swarovski Longwang Dragon is presently on display at the Swarovski Boutique in Indianapolis, Indiana which is the hosting city for the Football Super Bowl in 2012. Whether you live in Indy or are lucky enough to be in the area for the Super Bowl or some other occasion, this may be a great opportunity to see the magnificent dragon crystal myriad! Swarovski has just uploaded a video to YouTtube showing the Crystal Myriad Longwang Dragon. 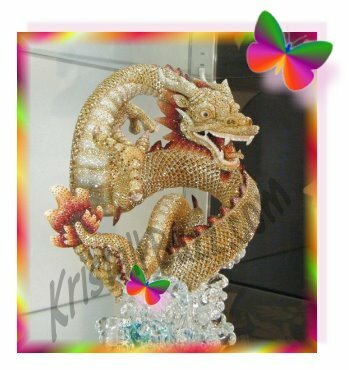 The Swarovski Longwang Dragon is the fifth Swarovski Crystal Myriad produced by the famous crystal brand. Longwang is among many Swarovski dragon figurines being released near 2012, the Chinese Year of the Dragon. The Swarovski Longwang Dragon is a limited edition masterpiece with a maximum production of 888, collectors might think that the dragon would be a quick sell-out. However, as retail price tag of $20,000, that could delay a sell-out. I checked the official Swarovski site for more information about the dragon, and it cannot be added to the shopping cart. Might this Swarovski Numbered Limited Edition be sold out? Or simply temporarily unavailable??? The Crystal Myriad line produced by Swarovski is a very elite group of sculptures. The Crystal Myriad Dragon Longwang is no exception. The Swarovski Longwang is now shown on the crystal brand’s web site, as the actual launch must be very soon. 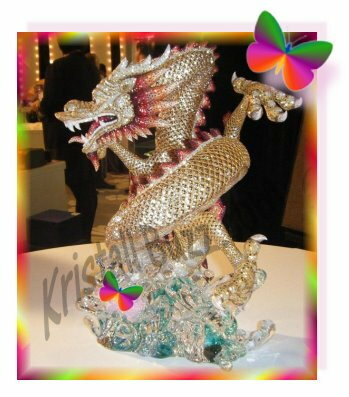 The company displayed the Swarovski Longwang at the SCS event in California just last week, and in a Swarovski event summary posted to the Kristall Buzz a few days ago, there were actual photos of the sculpture! Swarovski’s description of the Crystal Myriad Longwang states that “Longwang” means “King of the Dragons”. This crystal myriad is certainly king! Longwang is a Swarovski NLE Dragon of 888 units (The number 8 is considered very lucky, so it is likely that this had something to do with the max production.) Longwang contains over 66,0000 hand-set crystals using the Pointiage technique. The polished crystal base of Longwang dragon represents the sea, the dragon’s natural habitat. The Swarovski system # for Longwang is 1096974. The Swarovski designer is Heinz Tabertshofer. This dragon masterpiece is about 11.5” wide and 14” tall. Swarovski indicates that the production time for the Crystal Myriad Longwang is nearly 500 hours! On the crystal giant’s web site, the Swarovski Longwang can be found in a video that shows the Crystal Myriad revolving, zooming in on the meticulous craftsmanship of the figurine. Our local retailer stated that pre-payment is required and that the delivery date may be 8 to 12 months away. They originally indicated a price of $26,000, but the Swarovski site shows it at $20,000, so this might be pleasant news for Swarovski crystal fanatics who are considering to purchase it. For me, not a chance….anything over $17,000 must be drivable or inhabitable! A few of our Swarovski crystal fanatics clients were fortunate to attend the Swarovski event signing last weekend and have allowed us to pass that along to our Kristall Buzz readers! The recent Swarovski signing in LA’s hottest hotel, the Sofitel on October 29, 2011 featured Swarovski designers Anton Hirzinger and Heinz Tabertshofer. About 300 Swarovski collectors attended the signing during the day and were warmly welcomed by Swarovski staff. Just inside was a very large display of the gold tone Fortune Cookie introduced in 2010 and collectors were encouraged to take one home, compliments of Swarovski. Attendees entertained themselves playing Jeopardy for crystal prizes. A very nice highlight was that collectors were given clear crystal stars and decorative crystals to enhance them. This will be a nice remembrance of the day with Swarovski. On display was the Crystal Myriad Matang, Asian Elephant, NLE of 300, and the Crystal Myriad Longwang Dragon, NLE of 888. Longwang, shown below, is Chinese for ‘King of the Dragons’. (Isn’t that clever….2012 is the Chinese Year of the Dragon and Swarovski has created a Crystal Myriad for it!) Heinz Tabertshofer is the designer of both of these magnificent Crystal Myriad sculptures. A Swarovski outlet center was located near the hotel; so many collectors could not resist a trip to find the special retired treasure they had been looking for. The evening VIP cocktail party reception and dinner event was spectacular. 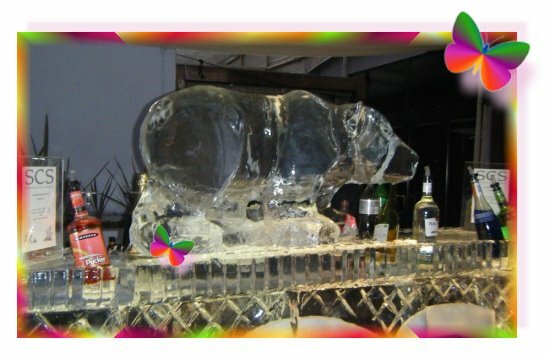 The bar was graced by an ice sculpture of the Swarovski Polar Bear. SCS members were recognized for special attributes, like youngest and oldest in attendance, traveling more miles to the event and some other things. After the comical Lucille Ball and other Hollywood look-alike performances ended and near time to go home, dinner attendees were given a set of the new Swarovski Wine Glasses. Sounds to me like the event was packed with Swarovski fanatics having a great time and that they were lucky to be there! Across the numerous Swarovski Crystal product lines, we find only a handful of figurines and statues that utilize the Stallion motif: one sold-out Stallion, two retired Swarovski stallions and two stallions that can be purchased directly from the crystal giant. The Swarovski Amurath is a Crystal Myriad statue designed by Elisabeth Adamer. 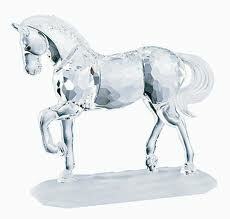 Like its Crystal Myriad counterparts, the Amurath Arabian Stallion is an intricate, luxurious statue. The Amurath Stallion is a Swarovski NLE of 300 units, each utilizing over 32,000 hand-set crystals. Due to the fragile nature and production time to decorate and attach the stones, this Swarovski stallion was built when orders were placed for it. This Crystal Myriad Stallion was introduced in 2010, and since has sold out despite the original price tag of $8,000. The other Swarovski Stallion designs are the Swarovski Arabian Stallion, Swarovski White Stallion, and Swarovski Stallion, and Swarovski Satin Stallion. The Swarovski Arabian Stallion, designed by Martin Zendron, was assigned Swarovski reference #’s : 7612 000 002 / 221 609. It was available from 1998 to 2005 and is marked with the familiar Swarovski Swan logo. The retail price at the time of availability was $265. In 2011, on the secondary market, it generally sells in the $200- $300 price range. 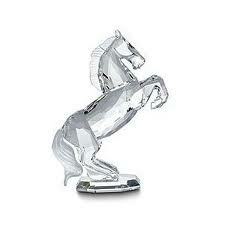 The Swarovski White Stallion, designed by Martin Zendron, was assigned Swarovski reference #’s : 7612 000 001 / 174 958. It was available from 1993 to 2005 and is marked with the familiar Swarovski Swan logo. The retail price at the time of availability was $265. In 2011, on the secondary market, it generally sells in the $100- $225 price range. The Swarovski Stallion, designed by Stefanie Nederegger, was assigned Swarovski reference #’s : 9100 000 068 / 898 508. It was released in 2007 and can still be purchased on the crystal brand’s web site for $400. The Swarovski designer was Stefanie Nederegger. This stallion is marked with the familiar Swarovski Swan logo. The Swarovski Satin Stallion, designed by Heinz Tabertshofer , was assigned Swarovski reference #’s : 9600 000 155 / 1 074 793. It was released in 2011 and is available on the crystal brand’s web site for $960. This stallion, which is a part of the Swarovski Soulmates collection, is marked with the familiar Swarovski Swan logo. Whether you are among the many stallion fanatic or crystal fanatics, these beautiful horse figurines may be something you would be interested to purchase. The retired stallions are smaller in size than the current stallions. They are approximately 4.25” long or tall (For comparison, the Stallion is about 5.75” long and the Satin Stallion is about 8.5” tall.) The retired Swarovski stallions also have a much lower price tag than the current stallions and can be found at www.CrystalExchange.com . Use the search feature with the keyword “stallion” to locate them in the store of this reputable Swarovski dealer. Within the Swarovski Crystal product lines, the falcon figurine is an infrequent design. Off the top of my head, I can think of only two Swarovski Falcon figurines and the Crystal Myriad Alsaqr Almalaki. The Swarovski Alsaqr Almalaki is a Crystal Myriad created by Elisabeth Adamer. Like all Crystal Myriads, the Alsaqr Almalaki is a very elaborate, expensive figurine, complete with a special Swarovski certificate. The Alsaqr Almalaki Falcon is a Numbered Limited Edition over 20 inches in height and containing over 43,000 hand-set crystals. Due to the fragile nature and overall production time to decorate and attach the stones, this Swarovski falcon is crafted as needed when orders are placed for it. This Crystal Myriad Falcon was introduced in 2010, and is still available for purchase in the Swarovski store, despite the overall maximum production of 300 numbered units. Having a price tag of $15,500 likely increases the time it would take for this statue to be a ‘sell-out’. The Kristall Buzz featured an article earlier this year about the Swarovski Crystal Myriad statues. In this article, a link to a YouTube video is included which shows a total of four Crystal Myriad figurines, including the Alsaqr Almalaki. The other Swarovski Falcon designs are the Swarovski Falcon Head. The Falcon Head was available in two different sizes: a small version about 1 ¾” in height and a large version about 4″ in height. 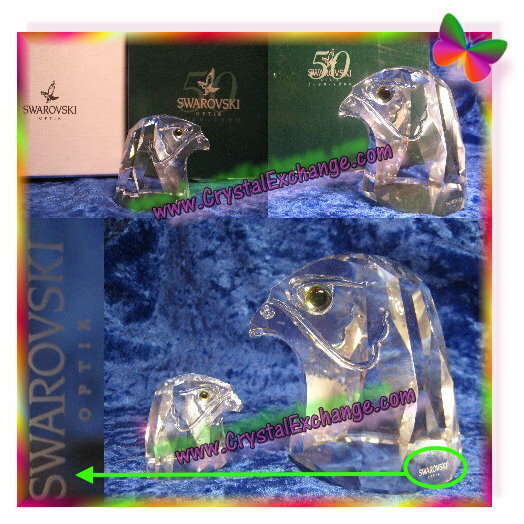 The Swarovski Small Falcon Head is known using the Swarovski reference #’s : 7645 045 000 / 013 829. It was available from 1986 to 1991 and has been seen with either Swarovski logo, the Block SC logo or Swan logo. The retail price at the time of availability was $85. It has also been documented to have some different faceting at the base of the neck area. The Swarovski Large Falcon Head is known using the Swarovski reference #’s : 7645 100 000 / 010 064. It was available from 1984 to 1991 and has been seen with either Swarovski logo, the Block SC logo or Swan logo. The retail price at the time of availability was $825. It has also been documented to have some different form/shape in the neck area. Years later, in 1999, the crystal brand produced some special sets of the Swarovski Falcon Heads. These special sets were produced for their own Optik division to celebrate 50 years of manufacturing. These Falcon Heads were packaged in white/forest green boxes. The larger falcon head was marked with the Optik logo (see left side of Falcon photo collage) and the small falcon head had the traditional Swan logo. The Swarovski Optik Falcon Head set is very difficult to find, but there is a set presently available at Crystal Exchange America now! Simply go to www.CrystalExchange.com and use the search feature with the keyword “falcon” to locate it in the store of this reputable Swarovski dealer. On the crystal brands own web site, there is Swarovski News about a Hollywood-style event taking place at the end of October, 2011. This designer signing event is a gala occasion for avid Swarovski collectors. The announcement states that this Swarovski crystal gala is October 29, 2011 9:00 – 5:00 at the Sofitel Hotel in Los Angeles, CA. The designers attending are Anton Hirzinger and Heinz Tabertshofer. Anton Hirzinger is the designer who created Swarovski Siku, (2011 SCS member edition), the Polar Bear Cubs that accompany Siku (purchased separately) , and the Arctic Hare (the special event piece). Having Swarovski crystal figurines signed by these two incredible designers of course! Naturally, plenty of opportunity to purchase more Swarovski crystal! This truly sounds like an event to remember! The Crystal Myriad Longwang Dragon sounds interesting. The other Swarovski Crystal Myriads have been limited editions and retail for $8000 – $16,000 USD. I am believing that this new Crystal Myriad in 2011 will follow suit being a limited edition. As far as price goes, that will likely be a function of the production time and quantity produced. But since the other Crystal Myriads have been out of my budget range, I don’t expect I’ll be adding the Longwang Dragon to my collection either. Reservations are required and registration deadline is October 21. Event cost $55 for the afternoon and dinner for SCS members is additional. More details on this exciting Swarovski event is available on the crystal brand’s website. I wish I were a lot closer to LA so that I could be there. I’ll be thinking of all the attending lucky Swarovski crystal collectors on that day! RetiredSwarovski.com is an established web site known for its up-to-date listings of Swarovski Crystal retirements. Recently, the Crystal Myriad product line of Swarovski Limited Editions has been added to the site documenting those Swarovski sculptures that the crystal brand has retired. The Swarovski Crystal Myriad sculptures are Swarovski Numbered Limited Editions, Swarovski NLE for short. The Crystal Myriad sculptures range in price from $12,000 – $18,000, and each has a maximum production of 300 units. The Crystal Myriad figurines are custom made shortly after an order is received according to the Swarovski web site. In 2009, Swarovski introduced four Crystal Myriad sculptures: a dragon Swarovski Jinlong, an elephant Swarovski Matang, a falcon Swarovski Alsaqr Almalaki, and a stallion Swarovski Amurath. According to the RetiredSwarovski.com web site, two of these four items are now retired. Swarovski used their own signature pointiage technique to apply 32,000 – 63,000 hand-set crystals. This same technique is also being used on the Swarovski Limited Edition Hello Kitty figurine which is to launch near August, 2011. The Swarovski Hello Kitty sculpture will be limited to 88 pieces world-wide and will have approximately 20K hand-set crystals. I recently found a Swarovski video that features issues from the Swarovski Crystal Myriad Collection on YouTube. I am a confused about the availability of the Swarovski Crystal Myriad collection. At one place on Swarovski’s web site, it states that the Swarovski Jinlong and Swarovski Amurath are sold out. However, it you go directly to the item on the site, it is still possible to add both of them to your shopping cart. From previous experience, if an item is not available on the Swarovski site, I’d see a button that indicates ‘go to the boutique finder’ vs add to cart. If you are interested in lower-priced Swarovski Limited Editions, many are available on the Crystal Exchange America web site. The limited edition Swarovski figurines can be found in the ‘Limited Editions’ and ‘SCS Annual and Limited Editions’ categories of the store web site. It is very common to see acronyms used in normal Swarovski descriptions and in online auctions (due to the limitation of characters in item titles). While the majority of Swarovski crystal collectors understand the acronyms, I’m sure there are still a lot of new collectors and inexperienced bidders (aka newbies) on the scene. So, I thought I’d take some time do my best to explain the acronyms, provide history, and offer cautions on the use of them. Swarovski NLE – Swarovski Numbered Limited Edition. The Swarovski Numbered Limited Edition pieces are Swarovski figurines that are etched with a number and have a pre-determined maximum production quantity. Examples of Swarovski NLE items include: Swarovski Eagle, Swarovski Peacock, Swarovski Wild Horses, Swarovski Elephant, Swarovski Bull, Swarovski Rhinoceros, and Swarovski Black Panther. Pictures of six Swarovski NLE can be found at http://www.swarovskibroker.com/ . The four sculptures in the Swarovski Crystal Myriad Collection are additional of Swarovski NLE issues. The difference between a Swarovski LE and Swarovski NLE is that the Swarovski LE itself is not numbered. There are also Swarovski LE figurines that have numbered certificates, such as the Swarovski masks and Swarovski Platonic Bodies. These items are not considered NLE since the number is not on the figurine itself. Hopefully this brief discussion will help all Swarovski collectors in knowing what Limited Editions and Numbered Limited Editions are. Understanding the differences is key so that no mistakes are made in understanding just how exclusive a particular retired Swarovski figurine may be. A newer Swarovski Crystal Myriad has been found on the Swarovski web site..it is the Alsaqr Almalaki. So what exactly is it? It is the newest numbered limited edition in the Swarovski Myriad series. The myriad figurine is a Swarovski falcon, in flight, gliding past a natural rock formation. It features over 43,000 hand set crystals of six different colors. The designer of this limited Swarovski myriad masterpiece is Elisabeth Adamer. This magnificent Swarovski falcon is nearly 12 inches by 16 inches by 21 inches. It has a retail price in the Swarovski online store of $15,500. It is not clear from the Swarovski site the maximum production number, only that it is a numbered limited edition. The official product page for the Swarovski Alsaqr Almalaki contains additional details from those mentioned here. The company has retired Swarovski falcon head figurines. The Optik division also sold a promotional set of Swarovski falcon heads years ago. There are other Swarovski figurines in the Myriad collection: Swarovski Amurath (stallion), Swarovski Jinlong (dragon), and Swarovski Matang (elephant). Swarovski Crystal Myriad collection announcements are very interesting.